Changing up your routine is hard no matter what aspect of your life is changing. 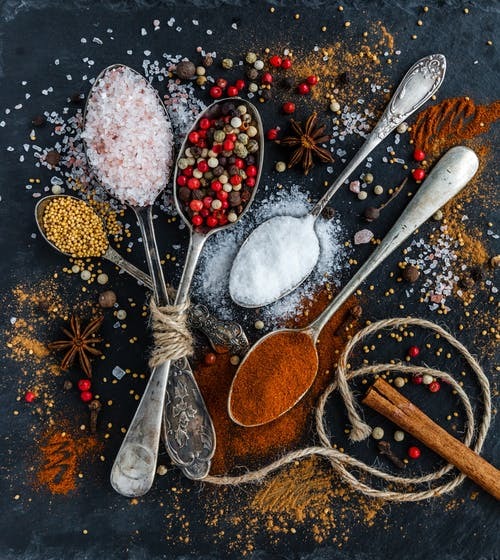 Maybe you cook, or maybe you’re new to it, either way, check out this list of seven delicious spices that will help your transition into the Mediterranean lifestyle that much easier! Each of these spices could be used instead of, or in conjunction with salt as the Mediterranean diet tends to go light on the added sodium. 1. Parsley: Parsley is perhaps best known in Mediterranean cooking for its role in the traditional dish of tabbouleh. Try adding this spice/herb as a garnish on just about anything for an extra punch of flavor! Rosemary: When I think Rosemary, I think Italian. And that is how I think of it while I cook too. If I am making something with tomatoes, onions, or garlic, it’s safe to assume I will be adding some rosemary to the pot. Try it in a red sauce, on poultry/lamb or on roasted veggies. Saffron: Saffron is a delicate spice that really packs a punch. It is known for being the world most expensive spice because it is so labor intensive to harvest. Try this spice in any rice dish, but especially experiment with it in a seafood dish and enjoying the beautiful yellow color it gives to your dish as well. Cilantro: Cilantro is great fresh and like parsley, it can be used to garnish just about anything, but my favorite uses are in a green goddess dressing or a homemade pesto! Both are easier than you think, and I will be posting recipes for both soon. Basil: Old faithful. Does anyone not like basil? I am a firm believer that basil makes any dish better, but the thing I love about basil the most is the fact that you can eat it raw right off of the plant and it will taste amazing! Try making something with fresh whole leaf basil, like a Caprese salad. You won’t be disappointed. Thyme: Thyme is perhaps best known in America as an herb accompanying a turkey dish, and you can think of it the same way in Mediterranean cooking. It is a great spice to use with a poultry dish, but don’t be afraid to throw a little bit into your veggie dishes as well! Oregano: I think we all mostly know this herb from pizza, and I know, “who doesn’t love pizza?” But oregano is so much more. This is one spice that tastes better dried in my opinion. It has a lot more flavor than if it is fresh. This spice is great on a fresh greek salad or sprinkled on roasted veggies. It is my personal favorites and I think you should try it on everything! Looking for more articles to help boost your healthy living? Check out our Fill Your Plate Blog. Looking for some recipes that the whole family will enjoy? Check out the recipe section on our website. This entry was posted in Cooking, Fill Your Plate, Food, Food Facts, Grocery, In the Kitchen and tagged Cilantro, cooking, Mediterranean Diet, Parsley, Rosemary, Spices. Bookmark the permalink.